Home > Uncategorized > Are You Surprised By 6 of the Most Common Health Issues for Senior Citizens? The average American can expect to live longer than ever before. In fact, data shows that when a person gets to 65 years of age, they’ll live, on average, another 19 years. That said, just because a senior citizen survives doesn’t mean they’re doing well. More than 60% of seniors in the U.S. would not describe their health as very good or excellent. The good news is that there are senior health care solutions out there. For example, at Rancho Wellness, we have staff members who only work with seniors. This gives them the ability to specialize in the sometimes-unique needs of seniors. 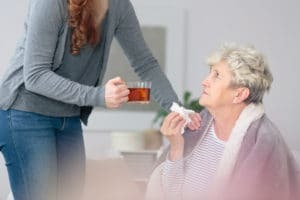 Read on to learn more about six of the most common health issues we help seniors with, and then call us at 909-483-7800 to make your appointment. Nearly half of people 65 years or older will have some form of arthritis. For some, it’s not much more than an annoyance. For others, it can greatly impact their quality of life. We can work with you to create a personalized plan that can help maintain your health and reduce the symptoms of arthritis. There’s no way around it: Heart disease is the number one killer of people 65 years old or older. About a quarter of women 65+ and more than 1/3 of men in this age bracket have heart disease. Risk factors include high blood pressure and high cholesterol. The best ways to treat heart disease including exercising, eating well, and getting enough sleep. We can help come up with a plan for you. Second only to heart disease, cancer is a leading cause of death in seniors. More than one-quarter of men and more than 20% of women 65+ are living with cancer. The best way to handle cancer is to find it early. That’s why seniors are often encouraged to get regular mammograms, colonoscopies, and other services. About 10% of men and more than 12% of women 65 years or older have asthma. About the same percentage have either chronic bronchitis or emphysema. Issues with the respiratory system shouldn’t be taken lightly – they can make a person more likely to get pneumonia and other life-threatening illnesses. More than half of adults over the age of 50 have some amount of bone loss – otherwise known as osteoporosis. This makes it more difficult for them to get around and lead to a higher chance of broken bones. About a quarter of people 65 years and older have diabetes. It causes more than 55,000 deaths each year. As is true of many conditions and diseases, the sooner it’s diagnosed, the better your chances are of successfully treating it. These are just six issues that can affect senior citizens. If you’re 65 years or older and you need medical care then we hope you’ll call us at Rancho Wellness. We offer specialized services that cater to your unique needs. Call us at 909-483-7800 to set up an appointment.